I have PCOS and it's making my life hell. I would also like to have a child but cannot fall pregnant. Do you have any helpful advice? Thank you. 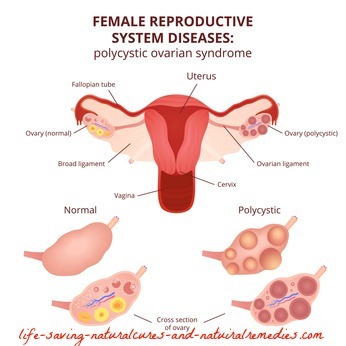 Polycystic ovarian syndrome (PCOS) is a common condition that affects anywhere from 5-20% of women at childbearing age and is the #1 cause of infertility. PCOS is caused by a hormonal imbalance and is characterized by abnormally high levels of the male hormone - androgen. Elevated insulin levels are also a prime cause of polycystic ovary syndrome because high levels of insulin make the ovaries produce excessive amounts of male hormones. In addition to these, inflammation in the body is thought to exacerbate PCOS as well. Natural Treatment for PCOS #1... Apple Cider Vinegar (ACV): Apple cider vinegar should definitely be your first choice for treating and reversing polycystic ovary syndrome. It's considered the ultimate hormone balancer and pH booster. In fact, ACV works so well that it's the remedy of choice for virtually all hormonal problems in both men and women - no matter what they are. Apple cider vinegar also helps to control blood sugar levels so your body doesn't produce too much insulin. Plus, it's a powerful anti-inflammatory (hence why it's regularly recommended for gout and arthritis). So what you do is mix two tablespoons of organic apple cider vinegar and a teaspoon of unsulphured black strap molasses (BSM) in a glass of warm filtered water and drink down (BSM is rich in essential hormone nutrients such as magnesium, iodine, iron and potassium so make sure you include this). Do this 3 times per day, 20 minutes before your main meal (on an empty stomach). So you should be having a total of 6 tablespoons of ACV and 3 teaspoons of unsulphured black strap molasses daily. For best results and to keep your PCOS away for good, make sure the apple cider vinegar and BSM drink becomes a permanent part of your daily regimen (so yes, you continue to have it for the rest of your life). You must also make sure that the ACV you purchase is organic and still contains the "mother" apple (very important). Do not use any other type of ACV as it will not work. Braggs apple cider vinegar is the best if you can get it... Bragg Organic ACV with the Mother. Natural Remedy for PCOS #2... Vitex Chastetree Berry: Chasteberry is a terrific hormone-balancing herb that's regularly prescribed by herbalists for treating menstrual problems such as irregular periods, excessive bleeding, cramps and menstrual pain. And it works exceedingly well for PCOS as well due to its powerful hormone normalizing action. You can find vitex in most health food stores or online... Vitex Chastetree Berry. Take 800-1200 mg's per day in divided amounts for 3 months then back off to 400-500 mg's a day after this. Keep in mind that chastetree berry works best with continuous, long term use. Home Remedy for PCOS #3... Fish Oil and Evening Primrose Oil (EPO): Your body needs a healthy balance of omega-3 and omega-6 fatty acids. According to a study published in the American Journal of Clinical Nutrition, the omega-3 fatty acids in fish oil help with PCOS by reducing androgen levels and improving insulin sensitivity, while the omega-6 fatty acids in evening primrose oil help to balance female hormone levels and increase fertility. Fish oil and EPO are also powerful anti-inflammatories. throughout the day would be the perfect balance and amount. Natural Cure for PCOS #4... Cinnamon: Cinnamon supplementation improves menstrual cycles and the symptoms associated with polycystic ovarian syndrome according to researchers from Columbia University. And a study published in the Fertility and Sterility journal found that cinnamon helps to reduce insulin resistance and normalize insulin levels in women with PCOS. Cinnamon also contains some strong anti-inflammatory properties. Cinnamon is such a widely available spice that you should have no problems getting a hold of it. Just remember to ONLY consume good quality Celyon cinnamon and not the cheap cassia cinnamon (very important also). Cassia cinnamon wont work anywhere near as well and can be toxic to the liver in excessive amounts. Add a teaspoon of cinnamon powder to a glass of warm filtered water daily and drink down. In addition to this, be sure to sprinkle some cinnamon on your cereal, yogurt, fruit, etc, as much as you can for an extra supply. Natural Treatment for PCOS #5... Eat Raw Cacao: Most women will agree that chocolate cravings seem to come on or be at their worst around the time of their period. The reason? An iron and magnesium deficiency! These two essential minerals are needed for healthy blood flow (and healthy menstrual flow) and also provide optimum hormonal balance. If you aren't receiving enough iron and magnesium, chocolate cravings can be a giveaway sign. But instead of indulging in a bar of commercial chocolate (which is extremely bad for you), go for healthy raw cacao instead. Raw cacao is rich in iron and magnesium, as well as many of the other essential nutrients. You'll soon notice yourself having better and smoother periods, along with more energy and clearer looking skin from a daily dose of one tablespoon a day of raw cacao powder. You can also use it to make your own "healthy" sweets and treats as well. Natural Remedy for PCOS #6... Spearmint Tea: Spearmint contains some powerful anti-androgenic properties and helps to reduce the effects of hirsutism (excess body hair) that many PCOS sufferers have. Take a cup of boiled water and add a teaspoon of spearmint leaves. Leave to steep for 20 minutes before straining and slowly sip. Drink this tea as often as you like. You can also use spearmint oil on your face as a cleanser if you're suffering from acne. It works a treat! Home Remedy for PCOS #7. Eat Healthy: Diet plays a crucial role in the development of polycystic ovary syndrome and its accompanying symptoms. "Clean eating" and "detoxing" are popular phrases that are bandied around these days, but they really are extremely important. You must avoid all refined and processed foods and junk foods, and instead, eat plenty of fresh fruits, vegetables, lean meat, seeds, nuts and grains. Feed your body the right foods and allow it to cleanse, repair and regenerate itself. Get yourself a NutriBullet or something similar and start your day with a nutritious and healthy smoothie (here's some easy recipes). I guarantee that when you do, you'll start to feel better than you've felt in a very long time! Natural Cure for PCOS #8. Exercise: Regular exercise is important for balancing hormones and maintaining your correct body weight. A major side effect of PCOS is unwanted weight gain and being unable to lose weight - so doing some regular moderate exercise every day will certainly help with this. And it doesn't have to be anything fancy either. A brisk walk or bike ride for 40 to 50 minutes is usually enough. Just make sure you get "huffy and puffy" for this period of time. Once you get your hormone and insulin levels right and metabolism sped up (from exercising), you'll find weight loss and maintaining your healthy weight a breeze. Natural Treatment for PCOS #9... Other Herbs and Seeds That Help With Polycystic Ovary Syndrome: Along with the herbs and spices already mentioned - turmeric, cayenne pepper, ginger, fenugreek, flaxseeds, saw palmeto, garlic, licorice and holy basil are all potent detoxifiers, anti-inflammatories and hormone stabilisers, so be sure to supplement with these and use them in your cooking as much as possible (or add them to your morning smoothie). You body will most definitely love you for it! So hopefully these tips and remedies help you out. Just want to say that I've found some incredible relief from using some of these remedies, particularly the apple cider vinegar which REALLY helped. Thank you very much! Hi there, Just a quick question. Is it all right if someone were to take all of the recommendations listed, or should I just pick a few from the list? I am about to start this treatment but would like to avoid any kind of overdose. I have pcos and am trying to have a baby. Can I take vitex and Clomiphene together? Although chastetree berry (Vitex) is a safe herb to take, you would still need to check with your health care practitioner first before combining the two, just to be sure. Hi Petra. Firstly, you cannot overdose on any of these foods and supplements unless you were to take an obscene amount. And even if you did do this "overdosing" on them would still be highly unlikely. They are all very safe. The idea is that you should follow and use all 9 of the remedies listed for best results. Also be aware that it will take a good 3 months for these remedies to really kick in, and a further 3-6 months for the results to show. So a little patience will be needed. Hi, I have been suffering from pcos for the past 5 yrs and I'm fed up with all the treatments. I went for homeo, allopathy ,ayurveda but did not get any results. They just work for the days of the treatment and as soon as the treatment is stopped, within a span of 1 year the condition is back. So if I use these will they help me get cured of pcod? Please help me out. Hi Rachel. These 9 natural remedies most definitely work, but you must use them all together and in combination with each other (holistic approach). And if you want to continue to be free from PCOS for good then you MUST continue to take/follow the recommendations listed above. As with Ayurveda, homeopathy, etc, these remedies are not a "prescription", they are a way of life and must become part of your life. If you stop following them then, yes, there is a good chance your PCOS will return also. Unfortunately, if you're looking for a magic bullet cure for PCOS, it does not exist. I thought I would share my story with you as it might help others. I'll try to keep it short. It is now June 2017 and my symptoms started in January 2017, first only with shorter or longer cycles, then in Feb my period lasted for 10 days, which never happened before as my period was always on time and lasted a max of 7 days (usually 5). I believe that every sickness is a result of an emotional drama or stress. I had been through a lot before these symptoms came so no surprise that I had health issues. A month later my period lasted 21 days! GP's, as we all know, other than generating fear could not tell me why this was and how to cure it so I decided to go ahead and cure it myself. I first visited a Chinese doctor, which seemed to be a good decision after the first 2-3 appointments, but after nearly 2 months of therapy (acupuncture, cupping and herbal tea courses) my period was still not balanced. By then I was constantly bleeding with only a few days off. You can imagine how much I worried and stressed myself and thought that I had cancer or something else. Then I went to a private scan clinic where they found a 3 mm cyst on my right ovary and the doc said that it was due to the emotional crisis I had been through (my dad passed away, I wanted a baby with my husband but it still hadn't happened, fighting with my sister). I first got a hormonal imbalance, then the cyst, then the irregular period - it was a kind of chain reaction. So then I came to your site as it already helped my husband last year with his skin problem. I ordered everything you listed above, however, the BSM and ACV arrived later than the vitamins so I started to take them first (except the Vitex as having read the reviews I wasn't convinced that it was for me, so instead, I started drinking Lady`s Mantle herb tea). I started to take the Evening Primrose Oil, Omega-3, D3-K2 vitamins and put raw cocoa and cinnamon into my breakfast cereal. I woke up with painful bowel movements and spent the night on the toilet. The next day my bleeding got heavier with clots and I just didn't understand why. Then I Googled the connection between bleeding and these vitamins and the pages I found said that they can cause bleeding so I immediately stopped taking them while I was waiting to receive the ACV and BSM. Till then I was drinking Lady`s mantle tea. Finally the BSM arrived and I started to take it at night and by the next morning I had much much less blood coming out. I was so happy that I took 3 teaspoons of the black strap molasses that day with each main meal. Then my ACV arrived as well and I drank this with the BSM. The result? I had some bleeding the first morning but nearly nothing later, then again some bleeding the next morning but nearly nothing later that day. At night there were some spots on my pad and that was it!!! I was extremely happy, I even cried! My bleeding, after more than two months of struggling and worry, had stopped. This was in May and my cycle seems to be balanced now and my next period came on time on the 28th day. This is my first period after the treatment. I haven't stopped drinking the ACV & BSM tonic and I don't take anything else. Now my period is at its 3rd day and it's not heavy at all and normal. I hope this time it will take only 5-7 days. We`ll see but I am very optimistic. I also changed my diet. No dairy, no red meat, no sugar, and I do some exercise 30 mins every day. Firstly, you're very welcome Petra. Glad the ACV and black strap molasses is helping. In regards to taking the evening primrose oil (EPO), vitamin D&K, cinnamon and raw cacao, if you had of taken them with the ACV and BSM (all in combination) you would have been fine and wouldn't of suffered any adverse reactions or initial worsening of your symptoms. Doesn't matter though, the ACV and black strap molasses is doing the job so that's all that matters. I have been diagnosed with PCOS in the last two years and my Gynaecologist is been putting me on Ortho Evra Patches and Minulette tablets for me to be on my monthly period. Is it safe for me to use any of the above methods with the hormonal pills or patch or should I opt for only one? Kindly note I don't use the patch and the pill at the same time. Myo-inositol helps greatly. I take about 4,000 mg per day. I was officially diagnosed with PCOS once I went off birth control over 5 years ago. I was able to get pregnant with my son after stopping birth control because the hormones that helped regulate everything were still in my body. Fast track 4 years. I was having really bad symptoms because I never went back onto birth control. In 2015, I only had 2 Periods, January 7th and August 19th. I was told by the Doctors that I had a 2% chance of getting pregnant naturally, and I was ready to start fertility treatments. I wanted to get pregnant with baby #2 in July 2015. I started working out 2x a day (Cardio AM – Weight training afternoon) and eating 100% clean. No dairy, no wheat/Grains besides rice (rarely), and a variety of healthy meats. I reduced stress and focused on me! I worked HARD. September 26th 2015 I conceived my daughter NATURALLY! Fast forward to 2017. I have been having trouble losing weight no matter what I do. I added ACV (I have also been told I am insulin resistant thanks PCOS.) ACV has helped cure my heartburn I’ve had since my pregnancy with my daughter. It has helped my body regulate my hormones, along with regular exercise and eating healthy. I started my current weight loss journey July 18th 2017. I am currently down 20 Lbs. I tested the results. I stopped drinking ACV 2 weeks ago. I haven’t changed anything else. Ive stopped losing weight. I did not know about Black Strap Molasses so I will be doing more research on that. But I am pleased to say and prove that ACV does help with insulin resistance and hormone balance. (I got my period around July 20th and now have it again August 25th). I drink 1-2 TBSP's 2x a day with water. Hope this helps anyone with doubts and wanting to get pregnant! Great story Alisha. Thank you for taking the time to share it with our readers. Can ACV and vitex be taken together?... please I need your reply. I Feel Sooo Much Better!! I started drinking ACV with BSM 3x a day, along with a daily smoothie of Bananas, Cacao powder, Chia & Flax seeds, Cinnamon, and Peanut Butter. I have little to no bloating (stomach is almost completely flat again), my skin has cleared up, my hot flashes occur less often, I'm not always freezing, I feel in control of my hormones, and my face is no longer oily. I also eat a salad at least 4x a week and I've cut out fast food. I eat pizza at least twice a month though. LOL. I have been suffering from PCOS for almost two years (that I know of). I gained over 40 lbs in only three months and couldn't lose the weight. I had even given up gluten (mostly). Since following this regimen I'm happy to say that in the past two months I have lost over 20lbs. I am now a size 8 after struggling to fit into a size 12 for two years! I am told that we have the genes in our family for PCOS. I was spared but my daughter has it. She has had her periods just once and then they never returned. She was gaining weight for no reason. She is quite active. My question: I am giving her plant based protein organic smoothies with banana, strawberry, blueberry and a slice of apple with flax milk. This is so that she gets enough protein and reduces her hunger. If we follow the regimen suggested, should we continue on the protein based smoothie? Absolutely. There's nothing wrong with the smoothies you are giving her. In fact, you could even add some of the recommendations above to her smoothies, such as the cinnamon and raw cacao, so she easily gets these every day. Been trying to conceive for a year now with no success. I have irregular period (PCOS), 7CM fibroid and little uterine polyps. Started taking the BSM and ACV yesterday. My question is can these work for the said issues? Is BSM and ACV sperm friendly? Can I take them all round my cycle including ovulation? And can my husband take them? Also, do they have any effect on male fertility? The unsulphured black strap molasses and organic apple cider vinegar (with the mother) most certainly help with both PCOS and fibriods... Miracle Home Remedy for Fibroids. Both are also completely safe to take indefinitely (yes for the rest of your life if you wish!) In fact they should be taken permanently just for overall good health. ACV and BSM also help with increasing fertility in both men and women, particularly the apple cider vinegar, which is one of the standard home treatments for infertility problems... Infertility: Natural Remedies to Increase Fertility. Hi, I was diagnosed with pcos and am trying to get pregnant. The BSM is not available in our area so will using the ACV and evening primrose oil work or even help? Thank you. It's a pity the black strap molasses is not available where you live. Could you possibly look at getting it shipped in - ordered off the internet? If not, the ACV on it's own and the evening primrose oil will still help. I have been trying to conceive for the last 7 years, since I got married. 2 years back my doctor diagnosed me with PCOD. I've tried doing all the various infertility treatments, from IVF along with Ayurveda medicines. I happened to come across everyone's reviews saying that ACV and BSM work wonders for treating and curing PCOD. I have immediately started taking these twice a day. Its been 2 weeks now. Will my periods become regular? I am loosing patience and all hope, but reading everyone's reviews above it is giving me hope and some ray of light. I'm waiting for my periods to come on time and in my next cycle, healthy follicles to grow. You MUST be patient if you want this remedy/protocol to work. Two weeks is nothing. You have to allow the supplements plenty of time to get fully into your system and start to work. This can take anywhere from 3 to 6 months. This is not a quick fix. It's a long term treatment and lifestyle change. Don't forget to eat healthy too or the ACV and unsulphured black strap molasses will not be as effective. The Vitex (#2 remedy) is also very effective for PCOS so try and add this to your daily regimen too if you can. I have suffered from PCOS for years now, although having children has not been my issue; I would like to know what is the very best combination from the list to use to stop my excessive facial hair growth! I need the cure now. I understand it is not a quick fix. I have already made major changes in my diet. I'm starting to exercise more. I just want the facial hair to stop growing. I have even tried laser treatment. Please help me! Excessive facial hair growth in women is caused by too high testosterone levels. So basically, it's a hormone imbalance. All of the recommendations listed above will help get your hormones under control. Make sure you take extra magnesium also as this mineral is crucial for balancing hormones and has been shown to help with hirsutism. A terrific magnesium supplement called Natural Calm is very good... Natural Vitality Natural Calm . I recently bought EPO to battle with PCOS, but I'm not sure when I have to take it? Some articles mention only during your menstrual cycle. So do I not take it on the weeks when I'm not having my period? Thank you so much for responding! I am definitely going to try your recommendation. I pray this is the answer for me to gain balance with my hormones. Thanks again! This website has been such a great help with all the information. Evening primrose oil should be taken every day indefinitely (permanently). It takes at least 3 weeks for the EPO to really get into your system and start working so there would be little value in only taking it during your period. By taking the EPO constantly it will help to normalize your hormones, and in turn, control the unwanted symptoms of PCOS, along with other problems such as PMS and heavy/irregular periods. It's really good to see that you're helping so many females by responding to their queries. I am also suffering from pcos and hormonal imbalance. The last 5 years I took homeopathic treatments but results were very mild. Started allopathic treatment last year but when I stopped my pills course I was back with the same issues. Started eating more healthier and have included apple cider vinegar once in the morning, fruits, pumpkin and sunflower seeds. Can you take evening primrose oil capsules rather than oil? And how do you take vitex chaste tree berry? I really want to get rid of this problem. Taking the ACV is definitely a good start. You should also look at taking the unsulphured black strap molasses as the two work very well together. Evening primrose oil can certainly be taken also, along with the Vitex. Follow the directions listed on the side of the bottles/containers for both of these and take the highest recommended amount listed. Also remember, you must continue to take these supplements every day (including the ACV). These are not like prescriptions where you only take them for a limited time. You should look to continue to take the supplements for the rest of your life! All the best to you Deepti! Can I use Heinz ACV? I've suffered from PCOS since the age of 12 and now I'm 20 and want to do something about it as I feel that its getting worse with acne, unwanted hair growth, etc. I'm a bit sceptical about taking the vinegar with water as I know its acidic and can damage your teeth in the long run. Will this combination still work if I miss out the ACV? The ACV is critical Kristina so it's not a good idea to leave it out. Either look to drink your apple cider vinegar through a straw or go with the ACV capsules instead... Apple Cider Vinegar Capsules. Hi, thank you for writing this extremely informative article. I am trying to follow all of your steps. I wanted to know if you can take Dim, spearmint and Maca together and which you prefer between holy basil and ashwaganda. Taking a dim supplement, maca and spearmint together is perfectly fine. Just be sure to follow the directions listed on the container(s). If you're taking any prescription medications then you should naturally speak with your health care professional first. In regards to which is better, holy basil or ashwaganda? This is difficult because they are both terrific! I would probably go with the one that is the most cost effective for you. Is it okay to add a mixture of lemon juice and water to the above combo? If not, what's the adverse reaction? I have had pcod for 3 years and am now 21 years of age. I am taking pcod tablets. Can I take apple cider vinegar with my tablets? Pure, raw apple cider vinegar is nothing more than the juice of fermented apples. There's nothing harmful or bad about this natural food. It would be no different to you eating an apple every day (which, as the saying goes, "keeps the doctor away"). Check with your doctor first if you want, but there is no harm in taking ACV with any type of medication. It's perfectly natural and perfectly safe. Hi, I was diagnosed with PCOS when I was 25. I was never regular with my period. My hormones were a mess... and to get pregnant I had to do infertility treatment in Mexico. It was just a pill to regulate my period (because if you don’t have your period every 28 a days you don’t ovulate). So I had my baby and now 2 years later (and an 18 month old baby) I want to get pregnant again but I haven't had my period for more 2 1/2 going on 3 months. My Dr says I have polyps. My question is can the ACV and molasses help with my period, at least until I get the surgery? And can I add a lemon to the mix? What brand does the molasses have to be? Please help. The ACV and black strap molasses are exceptional at balancing out male and female hormones. Once your hormones are back in balance, your periods will also become normal and regular. The black strap molasses can be any brand BUT it must be unsulphured black strap molasses and preferably organic. Here's some of the top brands... Unsulphured Black Strap Molasses. Lemon juice also helps to balance out hormones and boost the body's pH level (balance out your acid/alkaline base), which is also very important. The ACV does this as well. So yes, lemon juice is a good idea. Only have fresh lemon juice though, not bottled lemon juice. Cut up a few slices of fresh lemon and add these to your drinking water (you should be drinking lots of clean filtered water every day too). I have been diagnosed with pcos and I haven’t had my period this month. I’m really upset - don’t know how to cure this. Will all of these remedies get rid of my pcos for good? Unfortunately, I can't make guarantees Annie. What I will say though is that these remedies will most definitely help and you will not only see your period return, but normalize over the next 6-9 months. This is not a quick fix, it's a long term treatment. Just make sure you purchase quality supplements and follow the recommendations correctly. This is Anne from Nigeria. I have been following your chats. I have started using ACV without adding molasses for about 3 weeks now. Noticed a lot of changes like loss of weight, less cravings, eating less, and so forth. But my question: can I get pregnant immediately? Very difficult to say Anne. Usually, it takes more than 3 weeks for the full effects of the ACV and other supplements to kick in. With that said, there's no harm in trying to conceive. Do the apple cider vinegar tablets work the same as the liquid? Hi. I am suffering from ovary polycystic. I took Diane35 and used this medicine for one year. When I stopped though the symptoms came back. Can I take all 9 remedies you list during my periods? Absolutely Sonia. In fact, you need to follow the recommendations every day of the week no matter what. This is the only way they will work. Can we have dark chocolate instead of Cacao powder? If yes, which are good ones to take and what quantity should one have? Also, I have started drinking ACV and BSM together everyday morning before breakfast but my stomach gets a little upset after having the BSM. Shall I continue as I'm taking both of these once a day? Dark chocolate contains cocoa, which is heated during processing, so no, this is no good. Cacao is raw and natural. This is what you want to be consuming. Go for RAW chocolate rather than dark chocolate. Raw chocolate is rich in cacao. In regards to the BSM, if it's causing stomach issues you can either have it with food in the beginning or start off on a small amount and slowly increase over a period of several weeks. This is usually enough to get your body used to it. Also, make sure you take a good quality probiotic supplement every day to build up your good gut bacteria. Low gut bacteria is a major cause of stomach upsets and digestion problems.